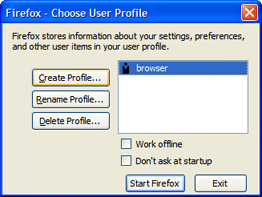 # Open the [[profile folder]] for the newly-created profile and remove its contents, which will consist of a small set of files that contain program defaults. # Open the [[profile folder]] for the newly-created profile and remove its contents, which will consist of a small set of files that contain program defaults. - #*'''Firefox Thunderbird and SeaMonkey 2''': Copy the contents of the xxxxxxxx.default folder and place them inside the new <profilename> folder. + #*'''Firefox, Thunderbird and SeaMonkey 2''': Copy the contents of the xxxxxxxx.default folder and place them inside the new <profilename> folder. #If you're using SeaMonkey or Thunderbird, check that you can see the folders for each account. If they're missing, use the "Browse" button for the local directory in [[Menu differences in Windows, Linux, and Mac|Tools -> Account Settings]] -> Server Settings and [[Menu differences in Windows, Linux, and Mac|Tools -> Account Settings]] -> Local Folders to specify the correct account and mail directories. #If you're using SeaMonkey or Thunderbird, check that you can see the folders for each account. If they're missing, use the "Browse" button for the local directory in [[Menu differences in Windows, Linux, and Mac|Tools -> Account Settings]] -> Server Settings and [[Menu differences in Windows, Linux, and Mac|Tools -> Account Settings]] -> Local Folders to specify the correct account and mail directories.